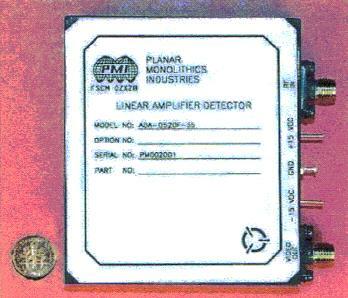 PMI Model ADA-0520F-65 is a 500 MHz to 20 GHz, -55 to +10 dBm dynamic range, DC coupled, temperature compensated linear amplifier detector module with 8nS rise time, 10nS fall time and 8nS propagation delay. Optional TTL or ECL compatible outputs are also available. This unit operates on +15 VDC @ 200 mA and -15 VDC @ 75 mA (other voltages available) and measures 2.5 x 2.9 x 0.5 with removable SMA connectors (smaller sizes available).